I LOVE cookies. I’ll pick a cookie over cake or chocolate anyday. Anytime a restaurant menu has “assorted cookies” on the menu I’ll order those. So, when a holiday like Valentine’s Day comes around my inner Martha starts channeling. I get so excited as I plan out my cookie. What kind of dough? What flavor will the dough be? Which cookie cutter to use? How many colors of icing? Should I use sprinkles? I mean, it just goes on… I keep having visions of those beautiful Martha Stewart cookies; decorated to perfection. And I know mine will turn out just the same. Look, I’m a pretty good baker. I’m fast and thorough. But here’s the truth, I don’t think anyone can create cookies (the decorated sugar) like she does unless you are a professional pastry chef or bake & decorate cookies repeatedly. I know it’s a challenge for me. So, once again it’s Valentine’s Day and I find myself in the Martha Cookie Bug haze of my own making. I made these special for all my Jazzercise peeps. And no matter the level of excellence, I have a feeling they’ll enjoy them. After all, I’m no Martha - I’m just a cookie lover, a pretty good baker and a less than perfect cookie decorator. Have a happy V-Day! You can find your cookie recipe on Nancy Baggett’s blog Kitchenlane. I did use Martha’s recipe for royal icing. You can purchase it nowadays but I always make it from scratch. It’s super simple. Here’s your link at Martha Stewart Recipes. For the last several years my in-laws have gifted us a subscription to the magazine, La Cucina Italiana. I love receiving, browsing and drooling over the pictures and recipes each month. However, I’ve never cooked or baked anything from it. That is until right before Christmas and our January/February issue came to the door with the title “Italy’s best desserts” and a picture of a red wine chocolate cake on the front. For some reason I had to bake that cake and I did. It didn’t take too much effort and the result was really great. I added a few extras to give it a little somethin’ somethin’: cinnamon and orange zest. And by simply adding the two extra ingredients the flavor dynamic crossed borders into Spain. This recipe is taken from the magazine and adapted from Francine Degan. It was a total hit over our Christmas holiday. That said I think it’s the perfect Valentine chocolate treat! Prepare a 9x3” springform pan buttering both the bottom and all the way up the sides with 3/4 of the tablespoon of butter. Then line the bottom of it with a round of parchment paper. Use the remaining 1/4 Tbls to finish buttering the parchment round. Whisk together flour, baking powder, cinnamon and salt in a large bowl then set aside. With either a Kitchen Aid or bowl and beater, beat 1C of butter and 1/2C of sugar until incorporated; light and fluffy. Add each egg yolk separately; beating gently to incorporate in to butter/sugar mixture. Stop and scrape down bowl as necessary. Add chocolate and orange zest, beat until just combined. To this add both wine and flour mixture in 3 different increments. Set aside. Take your egg whites and begin to beat (either clean or an additional set of beaters needed) them on medium until soft peaks form. While beating gradually add the remaining 3/4C sugar until the soft peaks become firm and glossing = hard peak. With a large spatula begin folding the whites into the chocolate batter. Continue folding the whites into the batter until no white remains. Immediately pour into prepared springform pan. Smooth the top with an off-set spatula, place into preheated oven. Bake up to 45 minutes checking at 15 minute intervals. Cake is done when a small skewer is inserted into the center and comes out clean. Take out of oven and place on a baking rack to cool. When cool release from pan, remove parchment paper and place on decorative plate. Garnish with cocoa by gently shaking it over the cake through a small mesh sieve. Serve at your leisure. Serves up to 8 people generously. Use a semisweet chocolate with up to 82% cacao. I used 62% and it worked out just fine. Use a good quality chocolate like Scharffen Berger which is what I used. If that isn’t in your price range then Ghiradelli works great too. This cake is great for a light dessert or for an afternoon pick-me-up with coffee and/or tea. This cake has a good shelf life. I had it on the counter for 1 week wrapped gently with plastic wrap and it lasted exceptionally well. No! I do not like bread that is naturally sweet or bread with candied anything, nuts or fruit. There, I said the blasphemous no word torward a beloved holiday food like, well, panettone. For those who don’t know what panettone is I’ll give you a little information. It’s a traditional Italian sweet bread that originated in Milan. It’s made with any number of candied fruit, citron, raisins and citrus zest; namely lemon or orange. It’s tall, light and in some instances extremely fluffy. What’s not to like? And that’s where Williams-Sonoma comes into my story. Now I’m not one to overly exclaim how much I like a certain space, but I really do love Williams-Sonoma (and don’t forget the s at the end of Williams). I’ve had a lot of firsts there like; teaching a cooking class, buying my first box of Maldon salt and most importantly having my very first taste of a sweet bread called panettone. This is your first look at the best panettone in the world! I must have been going through a weird, I want to try everything chestnut stage, during holiday shopping one year. I stepped into the store and they had samples out for a taste. And I did just that. OMG! I went back for more. Then bought not one but two cannisters of this delectible sweet bread. Then I walked out of the store and told everyone I knew about it. Now, it’s my go-to holiday party, house, family and just because gift. 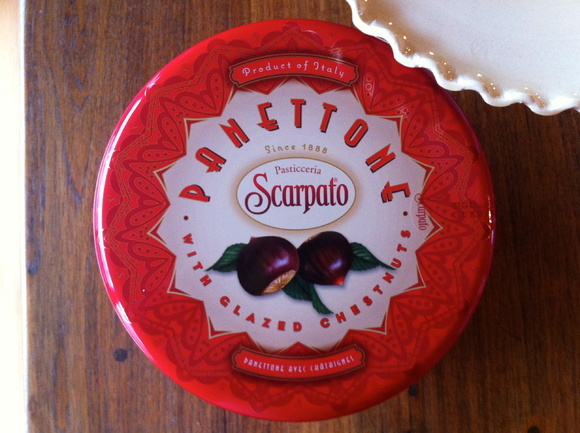 According to the labeling on the cannister that carries the panettone it is made by, Pasticceria Scarpato. However, don’t go tryin’ to “get it a little cheaper” by going to the source (Ok, true confession: I’ve tried.) Because you won’t find it easily accessible as it’s made exclusively for Williams-Sonama. Here’s my advice: buy it ON-LINE. Or if you really love the holiday mall shopping experience, RUN to a retail store. Don’t dwadle because they do sell-out. Like I said, I’ve always been a no person to a sweet bread. Let’s just say that this panettone has given me a new perspective on the tradition of a holiday sweet bread. The scent is what first hits you when you open the red cannister; lightly toasted caramel. The bread is soft and feathery with copious amounts of glazed chestnuts sprinkled throughout. It’s THE delectible holiday treat. And why I think it’s the best panettone in the world. In my book it’s always champagne time! I learned this one evening when we met our good friends, Max and Shari, for cocktails at their Texas home. It was any ordinary evening; just a Saturday going out. We knocked on their door and they greeted us with a bottle of their favorite champs from the Schramsberg Vineyard in Napa Valley. And this was before you could get it in the liquor stores or before wine of the month was mailed (legally) to any household here in Texas. So as you might imagine, and in my mind, this was super special. And why not, indeed! We drained the bottle merrily! Now it’s your turn. This is a super holiday (and remember - anytime) champagne cocktail. Simple to make, refreshing and a lighter alternative to other boozy cocktails. You need only make a simple syrup with star anise and buy a bottle of your favorite champagne. Pour 3 ounces of champagne into a champagne flute. Add 1/2 ounce of star anise simple syrup. Garnish with one whole star anise. Serve. You can add more star anise simple syrup if you want a bigger flavor and more sweetness. One bottle of champagne will serve up to 6 people.